ULTRA-TRAC® Acoustic Pipe Locator (APL) is the perfect choice for accurately locating unmarked buried piping systems. Acoustic Pipe Locator is ideal for finding plastic pipe systems and pipelines with broken or missing tracer wire. 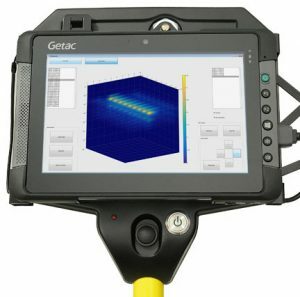 Natural gas, water and sewer laterals are easily traced using state-of-the-art acoustic technology. APL features an integrated tablet which allows the user to view scan data and 3D images of the surveyed underground area. The APL’s on-board software now features improved gain correction to eliminate false-positives. See the 3D Pipe Mapping video to learn more. APL will significantly reduce the number of unlocatable pipes and identify potential cross bore risk locations when using HDD technologies.